What are Lower Urinary Tract Diseases? Lower urinary tract diseases are a group of conditions that can affect your cat’s ability to urinate or use the litter box normally. Your veterinarian might refer to this as FLUTD (Feline Lower Urinary Tract Diseases), or LUTS (Lower Urinary Tract Signs). You might see some or all of the lower urinary tract signs listed below regardless of your cat’s urinary tract disease. If you cat has any of these signs, you should speak with your veterinarian as soon as possible. (Reproduced with the permission of The Ohio State University). There are many conditions that can cause your cat to have problems using the litter box to urinate. Here are a few of the most common causes, so that you can be well informed. There are other rare diseases that can cause lower urinary signs, and in those cases your veterinarian may need to refer you to a specialist. FIC is the most common cause of lower urinary tract signs in cats under 10 years of age. FIC seems to occur when cats are not provided with surroundings and equipment to meet their basic needs, keep them happy, and provide plenty of opportunities for play. 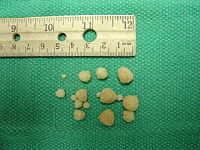 Urinary stones (see Figure 2) occur in 10-20% of cats. They can be found in the kidney, bladder, ureter, and/or urethra. Stones (and/or mucus) sometimes block the urethra (see Figure 1), the tube that carries urine from the bladder out of your cat’s body. This happens mostly in male cats, and can prevent them from using the litter box to urinate. This is called urethral obstruction. Although this happens in less than 10% of cats with signs of lower urinary tract disease, it is a true medical emergency when it does. Cats that cannot use the litter box to urinate can die within 72 hours. If your cat had a catheter, a thin tube inserted into their urethra, for a previous urinary obstruction, it is possible that your cat’s urethra was injured during the placement. This could result in the formation of fibrous or tough tissue, which causes your cat’s urethra to narrow and make it more difficult for your cat to urinate. UTI’s occur most commonly in older cats (10 years or older) that have kidney disease. UTI’s occur in less than 5% of younger cats with lower urinary tract signs. In less than 1% of cases, there are genetic causes of lower urinary tract disease. Fortunately, tumors in the bladder are rare in cats. After the first episode, your veterinarian may be able to diagnose your cat based on the findings from the history and physical examination. Your veterinarian may collect a urine sample from your cat and conduct several different tests. Depending upon the results from the urinalysis, a bacterial and sensitivity test may be needed to determine whether a UTI is causing your cat’s lower urinary tract signs. Blood tests may need to be performed to assess things like kidney function, blood cell counts, and thyroid hormones. These tests can provide more information about your cat’s current overall health so that a proper treatment plan can be prescribed. Figure 3 – Arrow is pointing at the radiopaque stone present in the cat’s urinary bladder. X-rays may help your veterinarian see stones in your cat’s urinary system (see Figure 3). Additional tests may be needed to see if your cat’s urethra is too narrow, or if there is a tumor in the bladder. Your veterinarian also may use an ultrasound or imaging test to see what might be going on in your cat’s bladder. Once your veterinarian has identified your cat’s disease, she will develop a treatment plan that best addresses your cat’s needs based on what was learned from the history, physical examination, laboratory tests, and/or imaging results. All cats with FIC and urinary stone disease need to have an environment that is rich with resources like a cat tree, scratching area, interactive toys, and human interaction to name a few. By meeting the needs of your cat, it is possible to reduce the risk of more episodes of lower urinary tract signs. It may be helpful to use pheromones if your cat is still anxious for any reason. Your veterinarian may recommend a therapeutic diet if your cat has urinary stones. Your veterinarian will order antibiotics when your cat has been diagnosed with a bacterial urinary tract infection. How Can I Protect My Cat from These Diseases? Meet your cat’s environmental enrichment needs, such as having a safe and secure place to retreat, opportunities for play, and positive human interaction. Clean your cat’s litter box every day. Provide more than one litter box than the number of cats in your household, if you have more than one cat. Always keep water available for your cat. Some cats prefer running water such as with a fountain. Keep your veterinarian informed about how things are going. Every cat has his own personality, so what works for one may not work for another. This is one of the many reasons why it is important for you to visit your veterinarian for routine examinations.